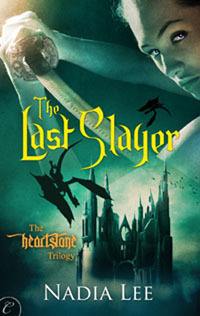 I am very happy today to welcome to the blog fantabulous (and incredibly friendly) author Nadia Lee, who is on a blog tour celebrating the release of her latest novel: The Last Slayer! Congratulations Nadia! *throws confetti and hands out champagne flutes* I am extremely excited about The Last Slayer because ever since I discovered Nadia's writing this year I immediately became one of her biggest fans. Nadia's writing is extremely vivid and intense, making the reader step into the story and live it right along with the characters. If you don't believe me or want to see proof, read my review of Carnal Secrets or my review of A Happily Ever After of Her Own, and even better, buy one of her books and see for yourself, you'll be in for a treat! But now I'll leave the floor to Nadia, please give her the warmest welcome, and read on, you could win a copy of The Last Slayer at the end! When I write, I almost always try to create heroines who are much cooler, more interesting and ... just more everything than me. If they aren't interesting enough to hold my attention, I know they'll lose my readers as well. Ashera: So. You want to be a demon hunter? Ashera: (eyes me skeptically, probably thinking I don't look like I know how to do anything physical) We require expertise in at least three separate styles of martial arts. Which ones do you hold belts in? Also, any special weapons? Me: Oh. Well... I don't really do actual martial arts, but I'm pretty decent at chopping onions with kitchen knives! I'm sure that'll make demons cry and make them unable to fight or something. Ashera: Hmm. Do you know any death spells? Me: Does high-pitched screaming count? I mean, you know, really loud high-pitched screaming? I think I can pop a demon eardrum or two. Ashera: (raises an eyebrow) If they have ears. Any other special physical abilities? Me: I'm pretty fast on my feet. Me: Oh yeah. I can walk really fast when I see a clearance sale sign at a department store. Ashera: Um. Okay. (mutters under breath) Maybe you should talk to my sister or something. I'm sure she could use you. Ashera: Nothing. (stands up) Thanks for coming in. We'll review your application and call you back. Me: (standing up) Thank you. I really admire your skills. I heard you bagged, like, hundreds of demons last year alone. You're like a lone woman demon depopulator or something. Ashera: (preens a little) Thank you. We'll call you back. (pushes me out the door as I babble about her accomplishments) Buh-bye! And there would go my chance at being a demon hunter. But seriously, everything in there is true. I'm not even all that fast, and I probably wouldn't be able to outrun a demon sloth, clearance sale or no. Is there a job -- whether supernatural, fictional or real-life -- that you think would be pretty cool but don't think you could do? If so, comment for a chance to win a copy of The Last Slayer! 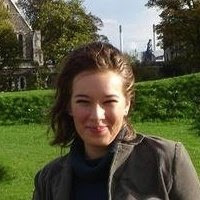 You can reach Nadia at her website, blog, Twitter, Facebook and Goodreads. Nadia has generously offered an ebook copy of The Last Slayer to a lucky commenter! 1) answer Nadia's question and tell us: Is there a job -- whether supernatural, fictional or real-life -- that you think would be pretty cool but don't think you could do? Giveaway is open worldwide and ends on 29 December 2011!